KLV Injector SDK™ is a .Net SDK that operates on MPEG TS stream / files and provides KLV metadata insertion and segmented recording (with optional preview) functionality. The Injector has two logical inputs - the first one for receiving a compressed and (optional) uncompressed digital video stream and a second one for receiving metadata information. Library outputs a multiplexed STANAG 4609 file / stream. The SDK allows rapid application development for MISB0601 metadata insertion into TS streams. 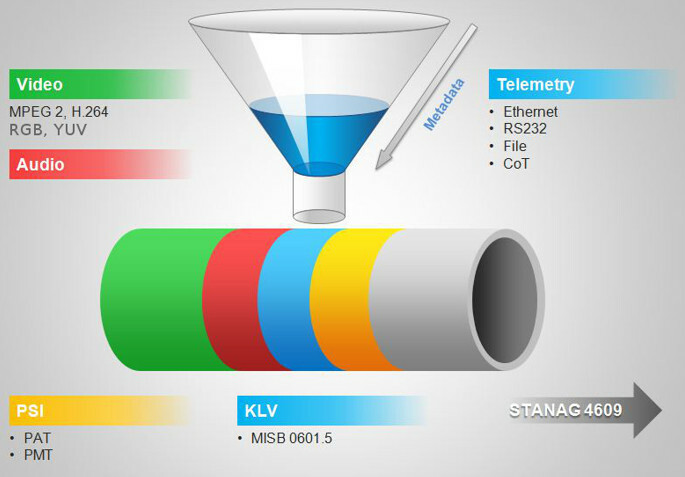 Receives MPEG TS stream from the network (configurable Nic/IP/Port) or file. Demultiplexes, decodes and renders the video using default (or bundled) decoder present in the system. Time Stamps extraction and notification. Metadata sources: RS232, Ethernet, File or as a memory buffer. Output targets - file or network. CoT (Cursor On Target) metadata conversion support.